It is SO hard not to get caught up in giving and getting STUFF this time of year. We work hard as parents to be able to have fun and give our kids cool things but sometimes I think what they really need is the opportunity to experience giving themselves, their time, and their energy. 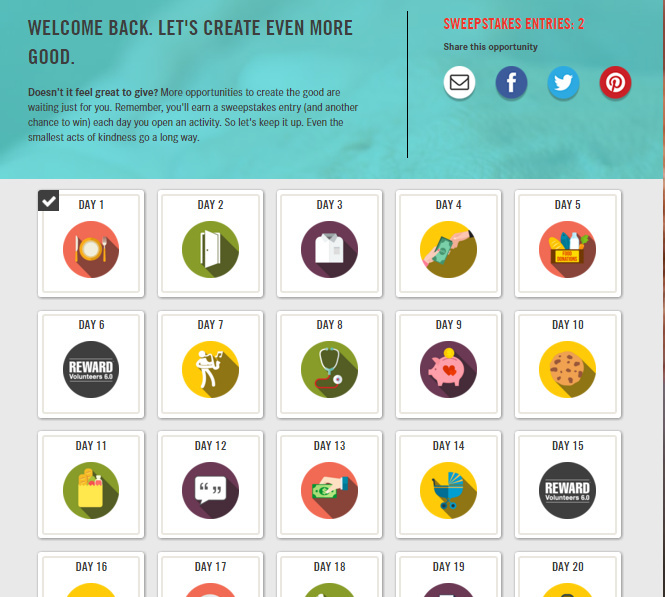 That’s why I really love the idea of Create the Good‘s 25 Days, 25 Ways to Give campaign. The idea is to take on one small positive action each day for 25 days to do a little good for your community. Volunteering was something I was good at when I was younger and I want to get back into that. I remember growing up, my high school would have a service week where we traveled to a poor part of Thailand and did various service projects. We’d play with kids, give performances, help clean, and do helpful chores. It was SUCH a good experience and I loved that it was an annual thing. In college I would regularly feed the homeless and think to do little gestures like save food I wasn’t going to eat to give away or just smile and chat with strangers in annoying long lines at the market. I like the idea of doing an Advent Calendar of Giving every year to help remind the kids (and us grown ups) that giving is about more than just stuff. 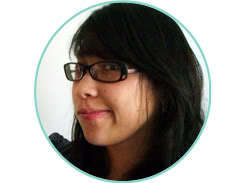 And I’m hoping that it will give me the boost to be more giving minded through out the year. Next either type up your giving acts or write them onto strips of paper. 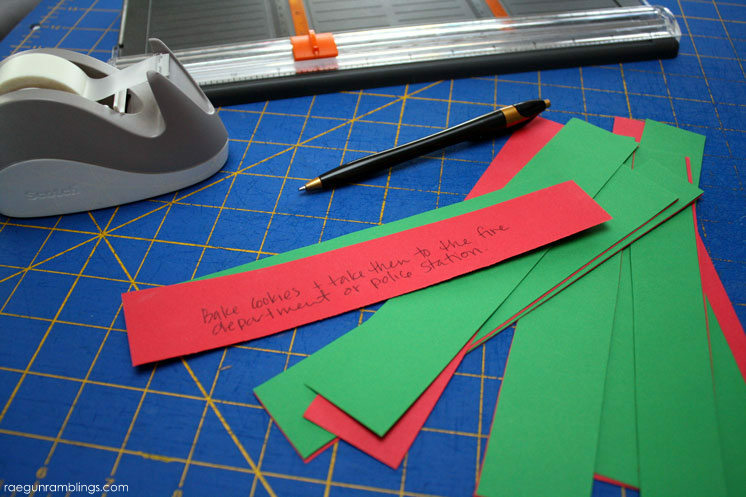 If you have kids old enough to write it would be fun to get the whole family in on writing the giving acts on the strips of paper. 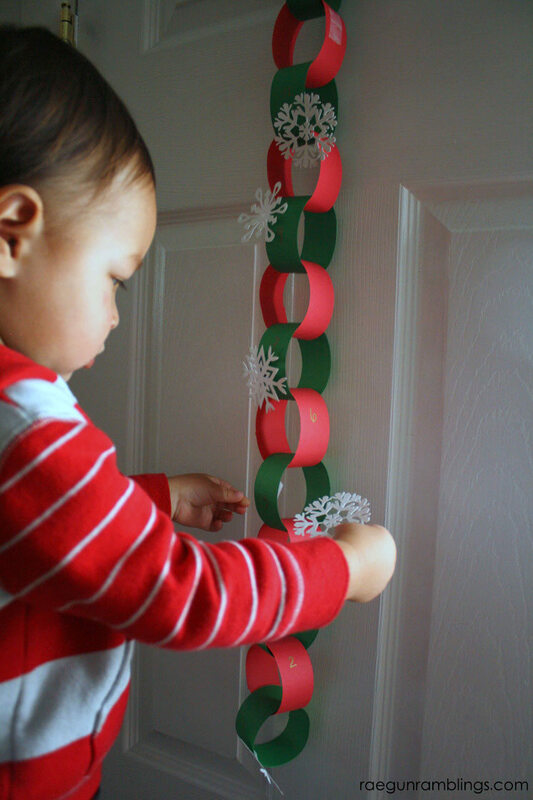 Then make a count down chain by looping the strips of paper into circles and taping them around each other to form a chain. Make sure the giving instructions are on the inside of the loop. And write the number of the day on the outside of the loop. Tie a ribbon to the top (onto day 25) and decorate if desired. 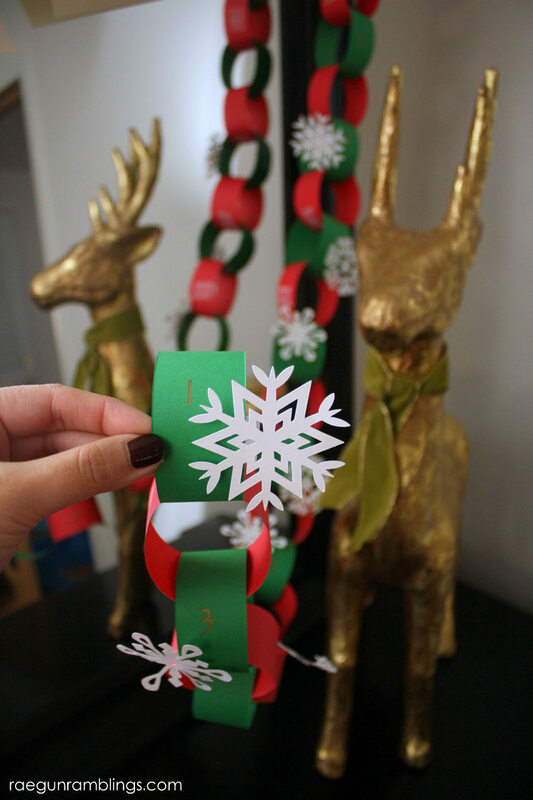 It’s fun to decorate the chain with snowflakes or other seasonal details. You can let the kids do it if yours are old enough or even cut out fun shapes with a Cricut or other cutting tool like I did. 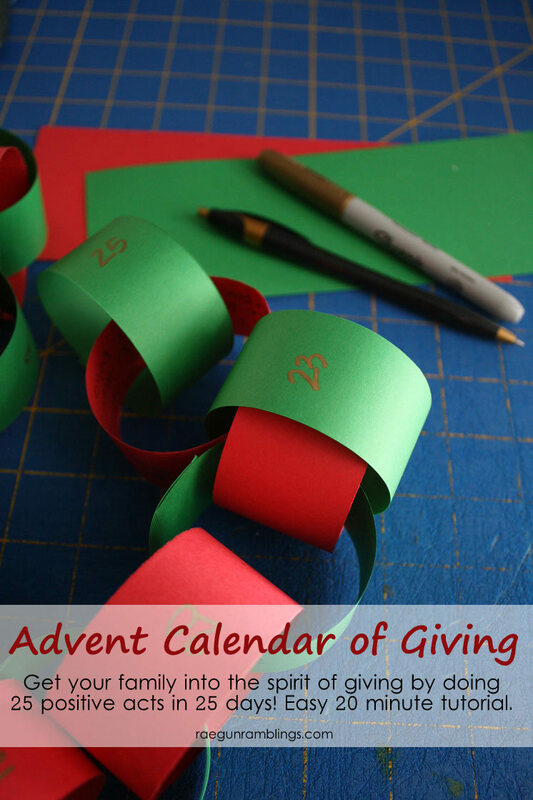 Then for the next 25 days you tear off a link in the chain to find out what your giving act will be for that day. Do you have any fun giving traditions that you do with your family? I’d love to hear what you guys do. 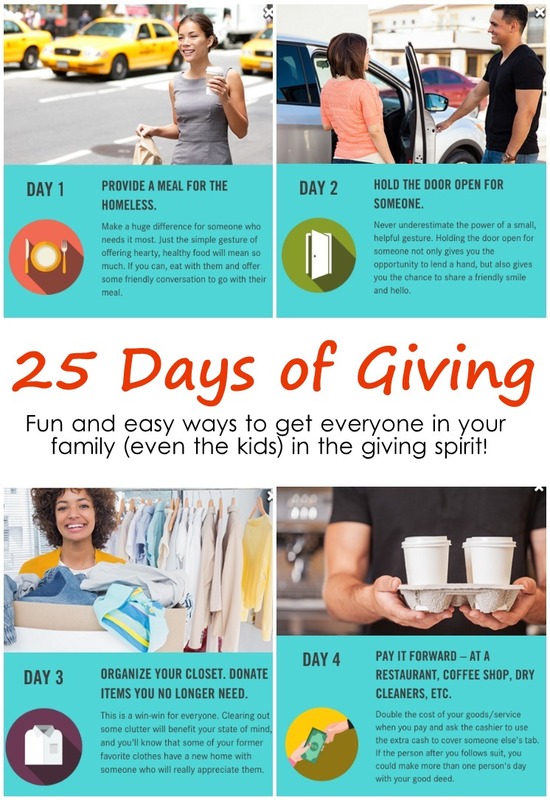 And make sure to check out Create the Good for more easy ways to give back to your community with just one simple act each day. We love doing acts of kindness in December. 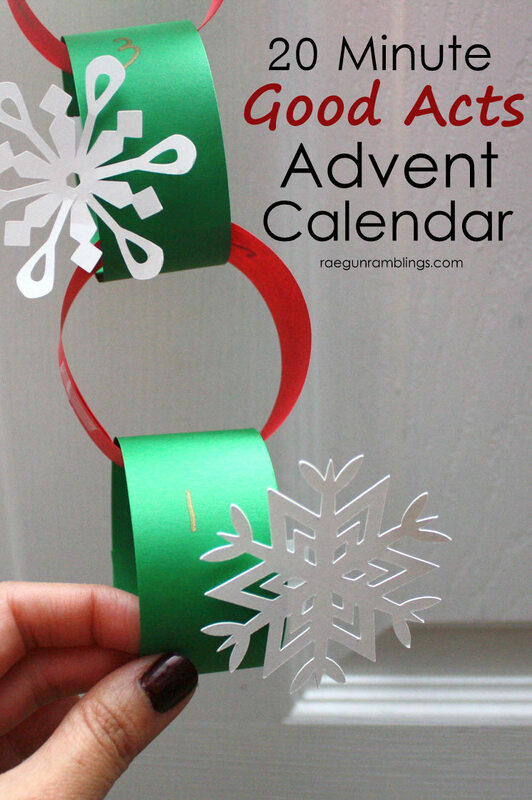 Love the idea of a paper chain! Totally love this idea! Makes doing acts of service much more fun for the kiddos! Good idea. Giving service/kindness is a great thing to be aware of during the holidays. Thanks for sharing with us at the #HomeMattersParty link party.